Japanese cuisine (和食, washoku) has a wealth of gastronomical delights. It has an endless variety of regional and seasonal dishes suited for either the budget traveler or the big-spender. 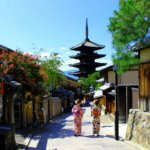 If you are a first-time traveler, be prepared to be overwhelmed by the abundance of food options to explore. 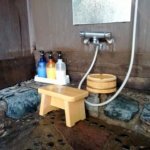 Their unique blend of flavors is an experience you will treasure and remember fondly for the rest of your life. 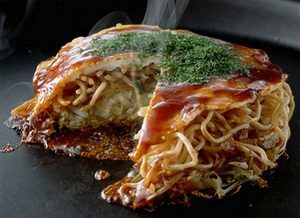 Made with chopped cabbage, okonomiyaki flour and eggs mixed with your favorite ingredients like sliced pork, seafood, rice cake or cheese topped with Okonomiyaki sauce, Japanese mayonnaise, dried bonitos or green laver as you like. 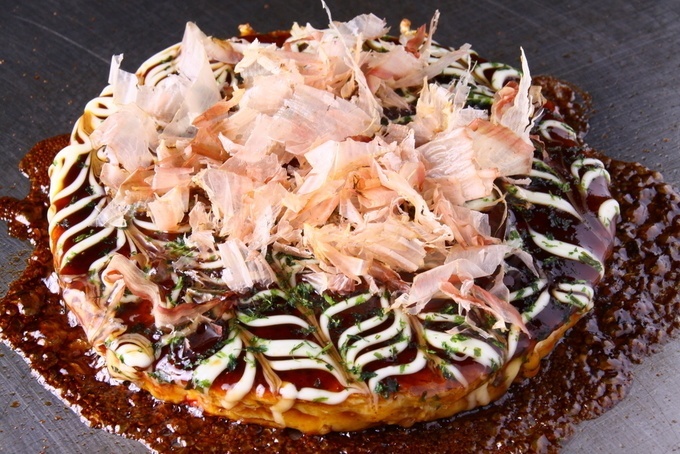 This is why we call this Japanese cabbage based pancake as Okonomi-yaki (your favorite grill). There are two different takes on this dish: the Osaka version whose mix is scrambled together, and the Hiroshima version is prepared by layering ingredients together with noodles (yaki-soba). Takoyaki is octopus that has been cut up and cooked in a takoyaki flour with egg and is shaped like a ball. These are then topped with mayonnaise, green laver (aonori), and dried bonitos as you like. 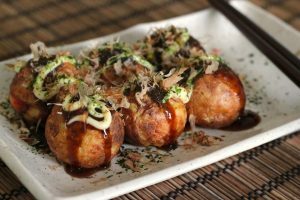 A crisp exterior surrounding with savory takoyaki sauce, they’re a favorite at festivals and as a late-afternoon snack. 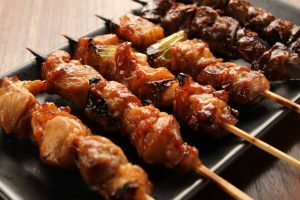 This is a Japanese type of skewered chicken on a bamboo stick and grilled over burning charcoal. 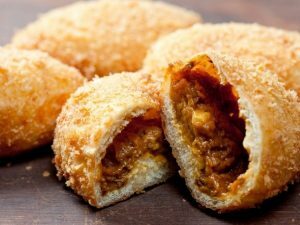 Typically, it is made with chicken thighs and wings but can also include chicken liver, skin, small intestine, or cartilage. 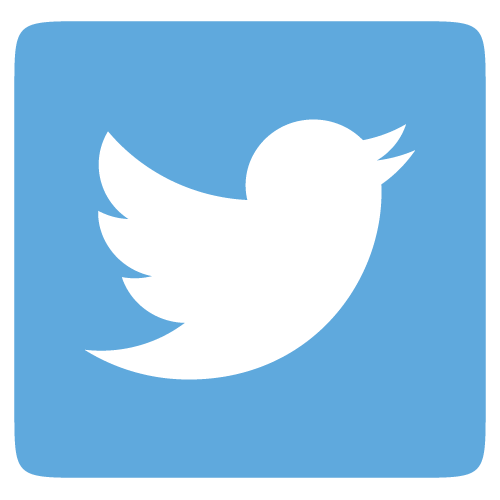 The chicken is usually seasoned with a thick, sweet soy sauce called tare or shio (salt). Yakitori is commonly eaten in the evening with cold beer or whisky soda called highball. Karee pan is a mildly sweet dough that is breaded then deep fried and at the center is Japanese curry which is milder than some Asian variants. Japanese curry diverged from its roots in India long ago and has evolved into an iconic dish in its own right. Beloved by schoolchildren and salarymen alike, it is known for its particular blend of sweetness, gentle spices and soothing mouth-feel that has made karee pan a popular snack. Although it originated in China where it is known as jiaozi, these affordable delicacies are very popular in Japan. 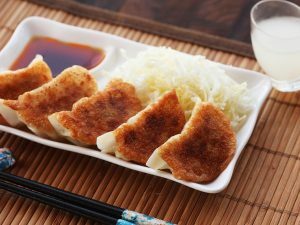 These are dumplings made with ground pork, green onion, nira chives, cabbage, garlic ginger, soy sauce, and sesame oil. They are then deep-fried and are enjoyed with a dip made from a mixture of soy sauce and vinegar. The Japanese version of Chinese chow mein. 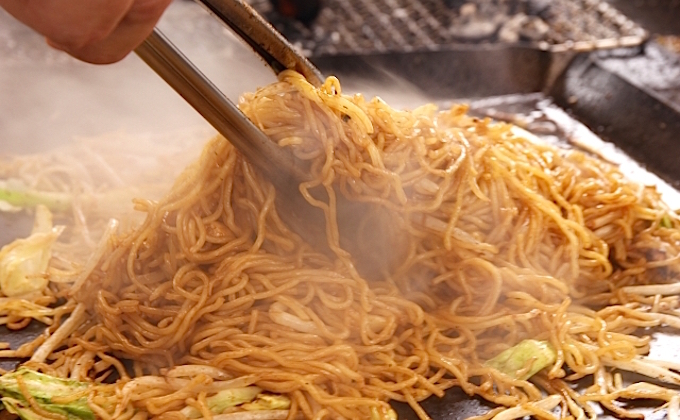 Yakisoba is made from ramen which is stir-fried with pieces of pork and combined with cabbage, carrots and sprouts. Yakisoba is typically flavored similar to oyster sauce, but slightly different. It’s a special fragrant Yakisoba sauce that arouse your appetite. ōtoro is the fattiest part of the Bluefin tuna found in the very underside of the fish. This cut is so fatty to the point of coming apart. It literally melts in your mouth and is oozing with Umami . This pink cut of tuna is speckled with snowy white bits of fat that is highly prized and sought after. ōtoro tuna is graded according to four categories #1 (highest), #2+, #2, and #3 that is based on five indicators: initial appearance, size and shape, color, texture and fat content. 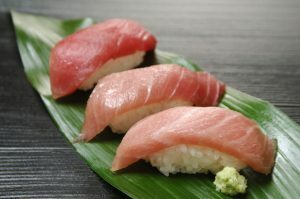 The best season for this kind of tuna is around December to February, when the tuna consumes large amounts of fatty fish. 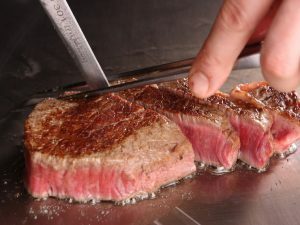 Considered as one of the most expensive beef in the world, Wagyu beef is Japan’s most sought after meats. Wagyū is raised only from specific regions and from specific breeds that come from a direct, traceable and pure bloodline. What’s so special about this beef is the superb and pervasive marbling. Developing this fat dense meat is achieved by breeding the cows for more than 30 months. The Japan Meat Grading Association evaluates the beef based on a score of its yield (A-C) and level of marbling, firmness, color and overall quality (1-5), with A5 being the highest possible mark. 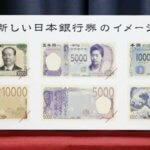 Visitors to Japan should expect to pay anywhere from ¥5,000 ($46) to upward of ¥15,000 ($138) per person. This popular ingredient is very pricey due to its rarity. 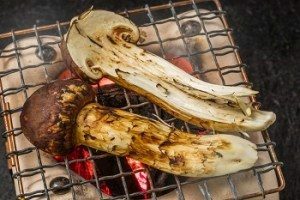 Matsutake mushrooms collected from the bottom of red pines in the Tamba region outside of Kyoto are said to be the best and the most expensive. Top quality matsutake retail for a respectable $1,000 per pound. 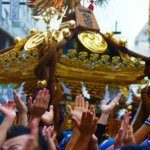 Japanese chefs treasure this delicacy and use their expertise to prepare dishes that bring out its strong fragrance and unique flavor. Annual yields of this mushroom are now less than a ton for an entire season. 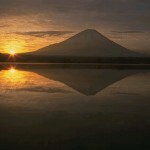 To this day they’re still given as important gifts, meant to symbolize fertility and happiness. 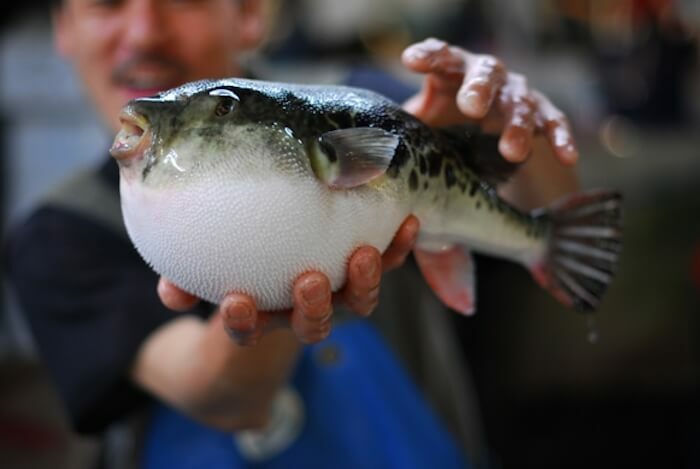 Fugu or puffer fish has a powerful poison that can be fatal so its preparation is tightly restricted by law in Japan and several other countries. Only qualified chefs who have undergone three or more years of rigorous training are allowed to prepare it. It is often served as sashimi and chirinabe. Most people say that the liver is the tastiest part, but it is also the most dangerous. 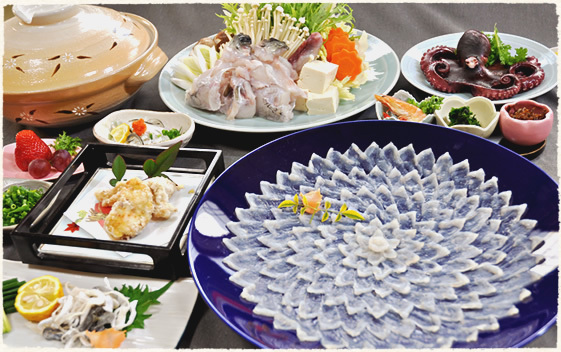 A full course fugu meal can cost ¥10.000-20.000 (US$100-200).